This hangout was recorded on November 6th, and features Laura Nicole, Pamela Gay, and Zachary Ricks. Last night I met with Starla Huchton and a new victim, J.R. Murdock. Today, at 9 pm, I’ll be meeting with Pamela Gay and Zachary Ricks. You can find out more at our YouTube Channel. Tonight I will be speaking with Justin Macumber and Nicole Ireland about their experiences over the first four days of NaNoWrimo. When I begin the hangout, I’ll update this post with the url for YouTube, where you can watch and ask questions/make comments if you like. Tomorrow we’ll be holding our first two “Hangouts” for the Living NaNoWriMo project. Join us for the fun! #1 – 2:00 pm Eastern – Kickoff Hangout for Living NaNoWriMo project. Dr. Pamela Gay, Martyn Casserly, and Nicole Ireland join P.G. Holyfield to talk about their plans for NaNoWriMo. #2 – 9:30 pm Eastern – Kickoff Hangout for Living NaNoWriMo project. Starla Huchton, Zachary Ricks and Justin Macumber join P.G. Holyfield to talk about their plans for NaNoWriMo. 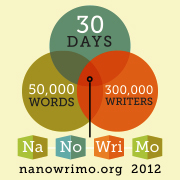 I have participated in NaNoWriMo on three different occasions (2006,2007, and 2009). The most I’ve ever written was the first year, when I managed to crank out 36,000 words on Murder at Avedon Hill. This year I will be ‘doing NaNo,’ and I’ve invited some friends to join me on this journey. You might know some of these writers, and podcasters (and one is best known as an astronomer), but these are all friends that are going to take time before November 1st and and take time away from writing during November to share their experiences, and in so doing, I hope we will help each other succeed at this. For those of you that don’t know, NaNoWriMo is National Novel Writing Month, November, and the goal of NaNo is to write 50,000 words in 30 days. More on this in the next couple of days, including information on the “Kick-off Hangouts,” which will take place on Sunday afternoon and evening. So what will “Living NaNoWriMo” be? It will consist of several Google Hangouts, longer form ones prior to November first, and then shorter ones during the month. I will be creating a page here on the site which will list the google hangout schedule, and I hope you’ll stop by and ask questions, and cheer us on. It’s all about ‘accountability’ and ‘supporting each other,’ and if you are doing NaNo as well, I hope we will be able to support you on your journey as well. Who are the participants that will be joining me on this journey? And of course me, P.G. Holyfield, proprietor of SpecFicMedia.com and author of Murder at Avedon Hill. Come back tomorrow for more information on the google hangouts that will take place on Sunday.